How good does this look?! The VC was the fifth Chrysler Valiant model to be built locally in Australia in Chryslers Tonsley Park factory in Adelaide, South Australia. The VC was introduced in March of 1966, replacing the outgoing Chrysler AP6 Valiant, and stayed in production until September 1967. Changes made over its predecessor were mostly cosmetic in nature, and the VC featured a new front grille, front bumper, front mud guards and a new bonnet. However, the VCs ride was also lowered noticeably in an effort to make the mid-size family vehicle look more sleek and elegant. The VC was made available to customers in three different body styles; a four-door sedan, a five-door wagon and a two-door ute. Power was derived from either a 3.7lt inline six-cylinder or a 4.5lt V8, and the shove from these donks was sent to the VCs rear wheels via either a three-speed manual or three-speed automatic transmission. 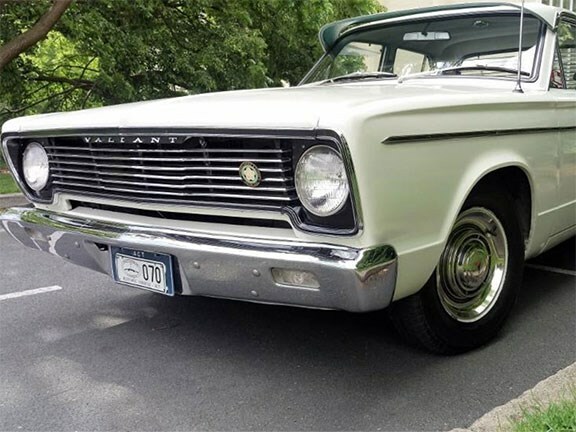 This particular VC is a 1966 sedan with the 3.7lt six-cylinder and the three-speed manual transmission. According to the seller, the vehicle has travelled an original 70,000 miles from new and is in immaculate, original condition. The seller adds that the vehicle is mechanically excellent and has even retained its original radio and heater. The super clean VC is $25,750 and anyone interested in this Aussie built classic can view the full listing here.